Cracks can develop in rotating shafts and can propagate to relevant depths without affecting consistently the normal operating conditions of the shaft. In order to avoid catastrophic failures, accurate vibration analyses have to be performed for crack detection. The identification of the crack location and depth is possible by means of a model based diagnostic approach, provided that the model of the crack and the model of the cracked shaft dynamical behavior are accurate and reliable. 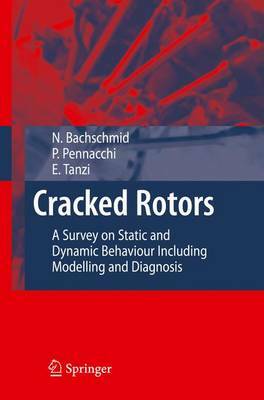 This monograph shows the typical dynamical behavior of cracked shafts and presents tests for detecting cracks. The book describes how to model cracks, how to simulate the dynamical behavior of cracked shaft, and compares the corresponding numerical with experimental results. All effects of cracks on the vibrations of rotating shafts are analyzed, and some results of a numerical sensitivity analysis of the vibrations to the presence and severity of the crack are shown. Finally the book describes some crack identification procedures and shows some results in model based crack identification in position and depth. The book is useful for higher university courses in mechanical and energetic engineering, but also for skilled technical people employed in power generation industries.